Knob and tube wiring is usually found in homes built before 1950 that have not had their wiring updated. Knob and tube wiring gets its name from the ceramic knobs that support it and the ceramic tubes that protect the wire as it passes through wood framing members. 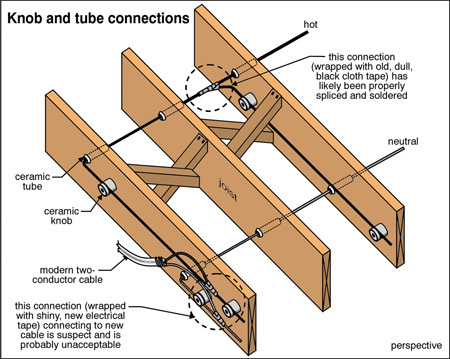 One can determine if you have this type of wiring in your home, by closely looking at ceiling joists or attic rafters. Or contact a licensed electrician for a detailed analysis. Home owners with knob and tube wiring may find it difficult or impossible to obtain insurance on their home because most insurance companies view knob and tube wiring as obsolete and a safety hazard. Insurance companies usually require a certificate of inspection and compliance from a licensed electrician, that all knob and tube wiring is considered safe and/or replaced with modern 3 wire grounded circuits before it will insure a home. Connections between modern wires are completed within enclosed electrical junction boxes. Knob-and-tube wiring had visible connections. The wires were spliced and soldered together and then wrapped with electrical tape. These connections are called pig-tail connections because one wire is wrapped several times around the other wire before the two are soldered together. Ceramic knobs were strategically placed to protect the splice ensuring that inadvertent tugging on the wire would not stress the electrical connection. In modern wiring, the hot wire (black) and neutral wire (white), along with a ground wire, are insulated separately and bundled in a single plastic sheathing. In knob-and-tube wiring, the hot and neutral were insulated and run through a house separately, usually several inches apart. Knob-and-tube wiring did not include a ground wire. Absence of a ground, which creates an emergency path for stay electricity that helps avoid shocks. • Poor connections: Problems with knob and tube wire is always the amateurish connections made after original installation. • Brittleness: The rubber insulation on knob and tube can become brittle. This can happen in high heat areas, including connections to ceiling light fixtures. While the differences are considerable, there is nothing inherent in knob-and-tube wiring that makes it dangerous. Knob-and-tube wire, properly installed, is not inherently a problem. While opinions regarding the safety of knob-and-tube wiring vary widely, the concerns are not with the original wiring, but rather with what has happened after the fact. 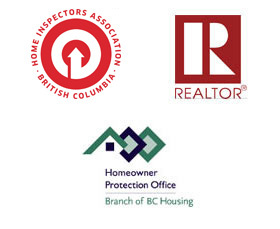 In summary inspectors need to be wary of this old system and be prepared to inform their clients about its problems. If you intend to purchase a home that may have knob and tube wiring then ask your realtor for advice on securing insurance.